This NO PLACE LIKE GNOME Pillow Case is a the perfect lighthearted gift for the gardener or gnome lover in your life. 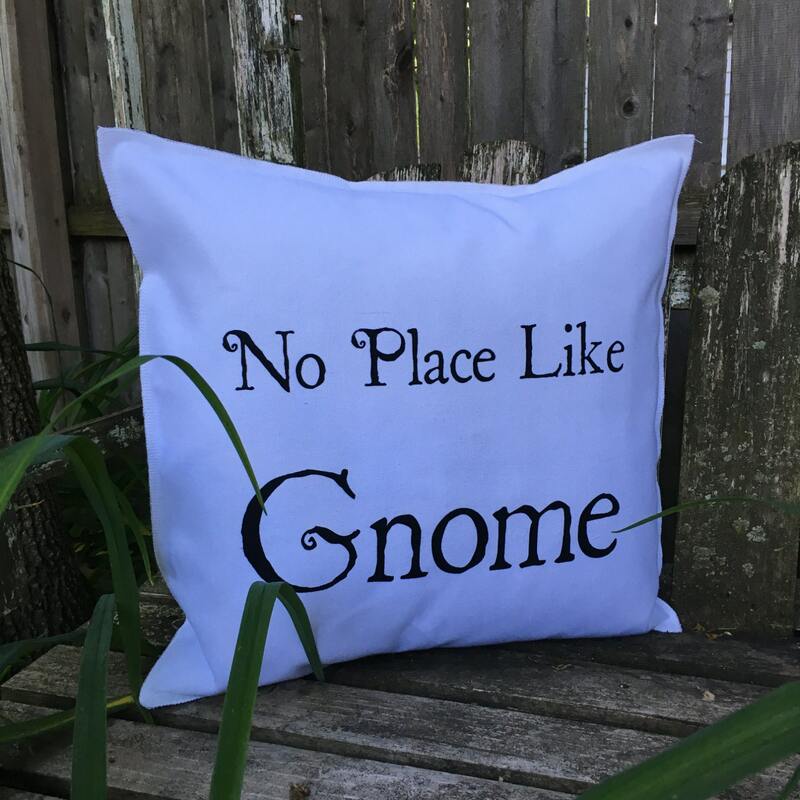 This listing is for one (1) white NO PLACE LIKE GNOME 18”x18” pillow case. The case is made from a sturdy, cotton duckcloth, giving your pillow a crisp, firm body. The case is sewn using a serger with the edges exposed, giving the pillow a more unique finish. The back of the case has an envelope closure to allow you to easily insert your pillow form. All printing is created and screened by me. With each item I sell being handmade there will be slight variations to each one. As pieces are being screened the ink flow differs leaving each looking slightly varied from the other. This gives all of my pieces a sense of charm and uniqueness. Simply Donnie products are made to order. Please allow up to five (5) business days for your item(s) to be created. All orders will promptly ship upon completion. PLEASE NOTE: You are only purchasing the decorative pillow case listed. It DOES NOT INCLUDE a pillow form. The case is made to fit an 18”x18” pillow form. Any items purchased from Simply Donnie are shipped via USPS. The shipping price included on this listing is for standard USPS ground shipping. Should you prefer USPS Priority Mail, please message me.